Rated for commercial gym use, Body-Solid's full commercial Power Rack, the SPR-1000, features everything you could want on a power rack today and tomorrow. 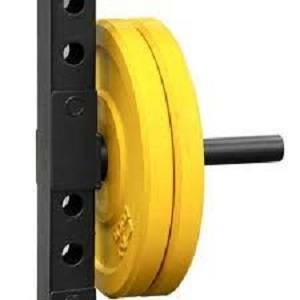 Keep your weights close and off the ground with the Weight Plate Horns add-on. Store your Olympic plates safely and securely on the side, 15" Long. Fits SPR-500, HEX RIG, HEX PRO RIG, or SPR1000 Commercial Power Rack.